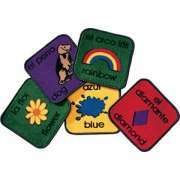 Purchase Bilingual Rugs For Your School. Shop Now! 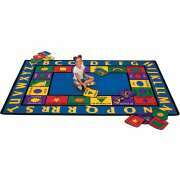 Make learning a second language tons of fun with bilingual classroom rugs. Why should you get a bilingual rug? With fun choices in both French and Spanish, you can give little ones the immersion they need to develop real proficiency. There is no better time to start teaching a language than in an early childhood setting when kids are most capable of working on proper accents and vocabulary. Like all of our classroom carpets, bilingual rugs have vibrant colors and exciting graphics. With letters, numbers and fun pictures, kids can practice the fundamentals of a new language even when they are not in the middle of a formal lesson. With a choice of shapes and many sizes to choose from, you can get a good fit for almost any area. How can I help preschool students learn a second language? Besides the obvious classroom instruction, immersion and musical techniques for teaching a second language, classroom decor can also play an important role in the process. Bilingual classroom rugs can be used as a formal educational tool, and also encourage little ones to review and utilize second language lessons independently. They are like having a giant learning poster on your floor where young students are likely to notice them. 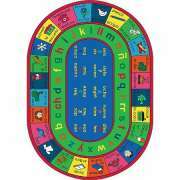 What activities can you do with a bilingual classroom rug? When you choose an educational classroom rug, you don’t just get a decoration and a cozy place to sit, you also get a fun learning tool. 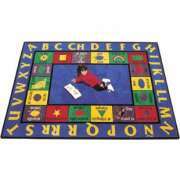 Bilingual rugs can be used in all kinds of lessons and activities. You can point to the letters of the alphabet as you sing them together or ask students to find a certain letter in the target language. A similar game can be played with numbers or picture identifications. For more advanced lessons, you can even ask little ones to read parts of the rug or compose a worksheet created around it. Why should you get classroom carpet squares? 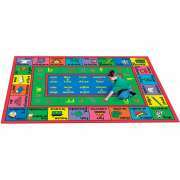 If you are looking for a way to enhance activities with your classroom carpet, bilingual carpet squares are a wonderful educational tool. 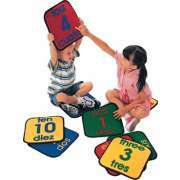 They can be used as regular individual student spots during circle time or be used in conjunction with a full-size rug for tons of fun activities. Students are sure to love searching for matching squares and identifying pictures in two languages. What languages do classroom rugs come in? Our bilingual rugs come in a choice of French or Spanish. We have designs that include the alphabet in the chosen second language and with numbers in both languages together. You can also choose designs with individual graphics with the word written next to them. Whichever language you choose, we have designs that are available in oval or rectangle shapes, in sizes that can fit well in a reading corner, circle time space or library.